A Manchester property company has appeared in court after two workers were spotted on the sixth floor of a city apartment block without proper equipment to prevent them falling. 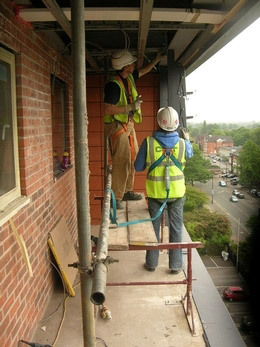 Options Properties Ltd was prosecuted by the Health and Safety Executive (HSE) after the men were found to be working 65 feet up next to a sheer drop at the Madison Apartments in Trafford on 14 May 2009. Trafford Magistrates' Court heard the men worked for a company called P&R Structural Glazing Ltd, hired by Options Properties to fit glass balconies to the properties in the newly-built apartments. The men had originally been working on scaffolding, but this was removed by Options Properties, leaving them with just a harness attached to a guardrail to stop them falling to the ground below. The inspector who visited the site was so concerned that he immediately issued Prohibition Notices on both companies, ordering them to stop work immediately. "It beggars belief that Options Properties Ltd risked the lives of these two men for the cost of a few extra days of scaffold hire. "There is no way of knowing whether the guardrail and harness set up would have held these men on the balcony. Had one of them slipped, he would have taken his colleague with him and they could both have fallen to their deaths. "I would advise other companies to have a proper work plans in place and to stick to them until the job is completed." Options Properties Ltd, of Princess Street, Manchester, pleaded guilty to breaching regulation 4(1) of the Work at Height Regulations 2005 by failing to ensure that the work was properly planned and supervised and carried out in a safe manner. They were fined £18,000 and ordered to pay costs of £4,115.